Sztuki Piękne pod Tatrami (Fine Arts on the Tatra Foothills) is a 500-page album about the most important Polish artists inspired by the area's mountain landscapes and folklore, and the first such in-depth guide to the Tatra area's pre-war history. Who would you have met on the 19th-century trail? The author of this elegant, bilingual album published by PWN is Teresa Jabłońska – an art historian specializing in folk art and the Zakopane style and the director of the Tatra Museum – who knows everything there is to know about the art of the Tatras. With passion and erudition, she sketches the first such comprehensive picture of the artistic and intellectual phenomenon that was the art community of Zakopane. 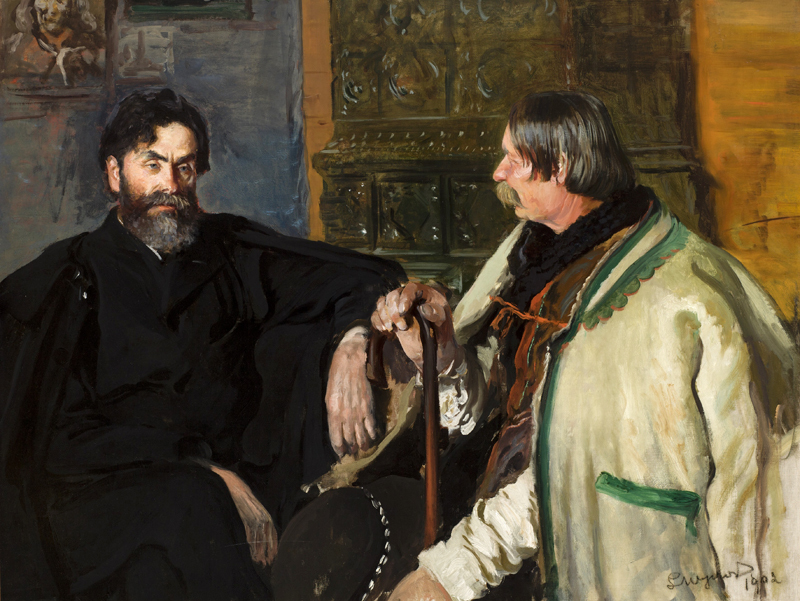 Artistic interest in the Tatras dates back to the early nineteenth century and coincided with the development of scientific exploration and tourism. The curiosity aroused by the mountains was accompanied by growing appreciation for homeland landscapes (and historical monuments) in the late eighteenth century, which intensified after Poland lost its independence. Since the time of Stanisław Staszic (1755-1826), the first Polish researcher of the Tatras, the mountains were regarded as the only independent piece of a homeland torn apart by foreign powers and became a symbol of freedom. A little later, as part of the Romantic movement, a fashion for visiting places that were unknown and unusual, wild and dangerous, developed, and this became an additional incentive to make more frequent trips to the Tatra mountains. Navigating the mountainous terrain is made easier for readers thanks to the detailed reproductions of the oldest Tatra iconographies and hundreds of realistic as well as modernist and avant-garde landscapes featured in the book, authored by Aleksander Kotsis, Wojciech Gerson, Awit Szubert, Walery Eljasz, Leon Wyczółkowski, Stanisław Witkiewicz, Władysław Ślewiński, Zofia Stryjeńska, Leon Chwistek, Rafał Malczewski, Witkacy, and many others. The album presents the history of the first Tatra photographers, pictures of the modernist Young Poland, and Zakopane during the Great War. For starters, we’ve selected several interesting artistic points on the historical map of the Tatras. Mountain photography is a difficult and physically challenging field. According to the album's author, Poles photographing the Tatras were as good as the photographers of the Alps or the Pyrenees from Western Europe. It is enough to take a look at photos by the 19th-century photographer Walery Rzewuski, the owner of a Kraków studio who regularly (starting in 1859!) dragged his cameras, tripods, and mobile darkroom into the mountains. He was the author of Czytanie Niedzielne (Sunday Reading), the oldest preserved image of Tatra highlanders. A detailed reproduction of this photo is a beautiful decoration of the book. 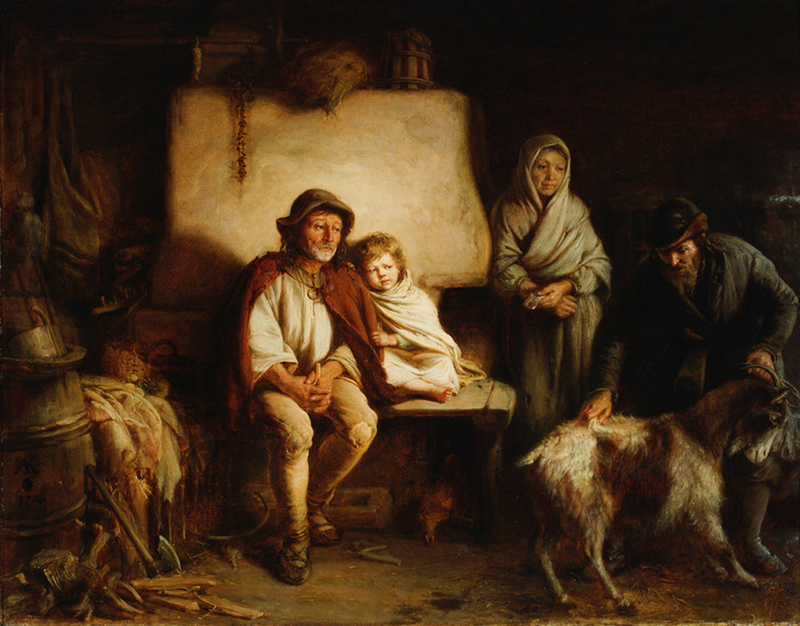 The same applies to the other historical pictures included, such as one from 1871 by artist Herman Vogel of Berlin: Shepherds at Hala Królowa, looking boldly at the camera. Where photographers and even tourists were unable to go, early 20th-century mountaineers (called Taternicy in Polish) ventured. Equipped more lightly, with more up-to-date cameras, they strived to document both the beautiful landscapes and their risky, pioneering climbing attempts. 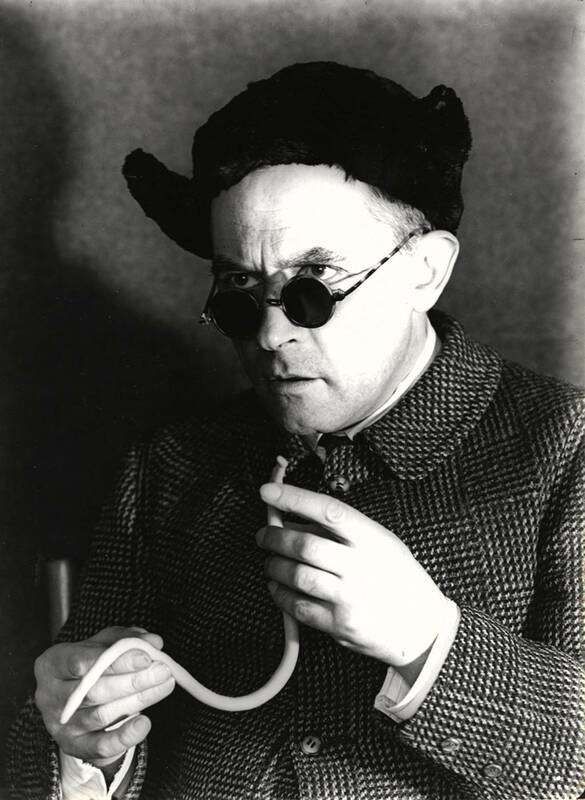 One such extreme artist was Mieczysław Karłowicz, a distinguished composer, who died in an avalanche during a lonely expedition to Hala Gąsienicowa. As Jabłońska reminds us, he intended to try out a new camera during a particularly beautiful winter. 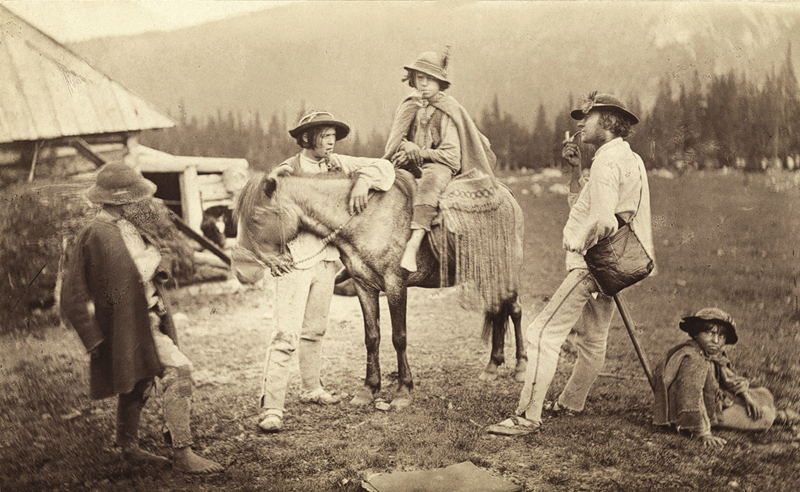 An interesting section of the album is the series of photographs of Zakopane's inhabitants, which for decades were reproduced on postcards (and hundreds of their negatives remain in the collection of the Tatra Museum). They immortalised the social, sporting and cultural life of the ‘Polish Davos’. …or more precisely, a mere hut. 'The Hut' is what the now-vanished house of the collectors of the art of Podhale, Maria and Bronisław Dembowski, was called. Jabłońska emphasizes that it was Zakopane's first informal cultural salon. Among its patrons were Stanisław Witkiewicz and friend of the host Henryk Sienkiewicz, as well as Józef Mehoffer, Albert Chmielowski, Stefan Żeromski, Helena Modrzejewska, Tytus Chałubiński, and many other outstanding admirers of the Podhale region. It was in the Hut that in the winter of 1886 the concept of original mountain architecture was born, when the Dembowskis introduced Stanisław Witkiewicz to the previously-unknown world of the Tatras. Soon, the first objects inspired by highlander patterns and the first house in the Zakopane style were designed. The house combined the highlander traditions of construction, carpentry, and woodcarving with European designs of villas and spas. You will also find other photographic keepsakes of the era in the album: photos of napkins designed by Witkiewicz, metal coffee sets, altars, chalices, cupboards, and wedding dresses – also tailored according to highlander trends. The author opens the doors to stylish villas and guesthouses featuring original furnishings from the late 19th century. She also guides the readers around the architectural trail of Witkiewicz. Mr Kotsis has improved significantly. His picture Trip to the Tatras can be recognized as an example of a very successful artwork. This mountain hut, those dirty and smoky juhases, and the elegant lady resting after the exhaustion of the climb… create a charming contrast between the town elegance and the wild Alpine nature, covered in fog and full of great mysteries. Besides portraits of juhases, the album presents realistic grey landscapes by Kotsis (such as Giewont in the Clouds or the Tatra View), juxtaposed with the works of Warsaw artists, who were becoming more and more interested in the Tatras, e.g. Wojciech Gerson, Alfred Schouppe, and later Leon Wyczółkowski. 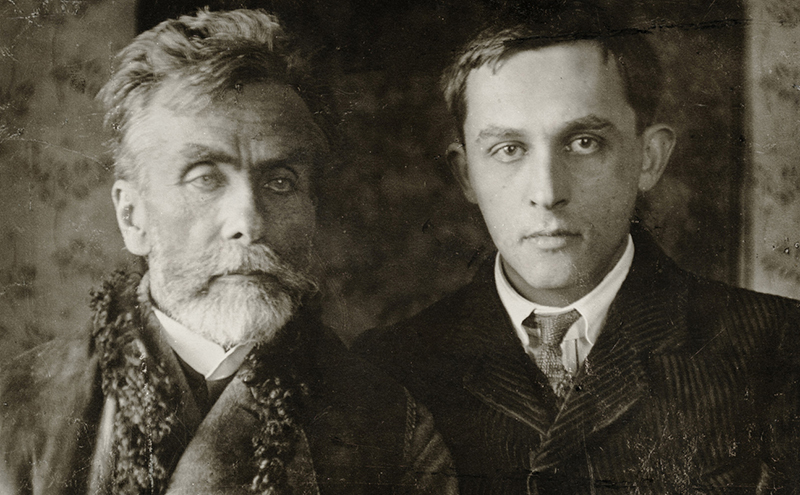 Ślewiński also met young Stanisław Ignacy Witkiewicz (Witkacy), whom he influenced significantly. Asking the firm for its opinion of a finished portrait is not permissible, nor is any discussion about a work in progress. The firm reserves the right to paint without any witnesses, whenever possible. Portraits of women with bare necks and shoulders cost one-third more. Each arm costs one third of the total price. 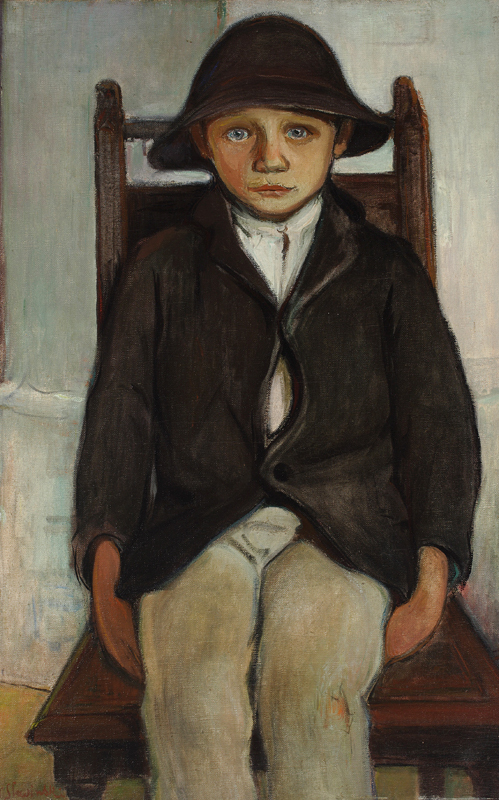 For portraits showing the upper body or full figure, special agreements must be drawn up. The portrait may not be viewed until finished. The technique used is a combination of charcoal, crayon, pencil and pastel. All remarks with regard to technical matters are ruled out, as are requests for alterations. In the interwar period Witkacy gave up photography, but in 1931 he met Józef Głogowski, the photographer who became the author of most of the photos of his ‘mimic theatre’. His task was to register the absurd faces and scenes played out by Witkacy during the photo shoots. It is with this unique series of portraits that Teresa Jabłońska finishes this artistic trip around the Tatras. Source: Teresa Jabłońska. Sztuki piękne pod Tatrami/ Fine Arts at the Tatra Foothills. Warsaw: PWN, 2015.